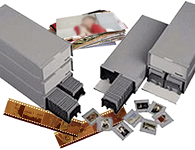 The preservation of photos, slides and films is important to you? Chose SilverFast to safely digitize and archive your priceless memories of the past. Now, we introduce our latest tool, the new SilverFast 8 Printer Calibration, which empowers you to print your memories in high quality while at home. As a result, your images won't disappear in your hard-drive, but instead be framed on the wall at home, at work or be displayed at the next family party. Thanks to the new SilverFast 8 Printer Calibration, you now have access to professional-grade-capabilities, allowing the creation of brilliant photos from the ease of your home. SilverFast is able to create an individual profile for every printer, ink and paper combination. The Printer Calibration helps to always bring out the maximum quality of your originals. Avoiding the inexplicable high costs of expensive hardware, SilverFast's new Printer Calibration utilizes an existing scanner as a measuring instrument. Subsequently, the recommended Priter Calibration selling price lies under EUR 100. Be sure to check if you are eligible for an exclusive Upgrade by clicking on the following link. Since color is a subjective perception, SilverFast offers the option of editing the generated profile according to the user’s desires. This inherently complex task of color space adaptation is very easy to handle. 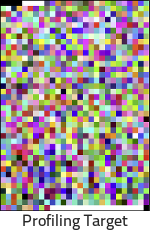 Based on the generated ICC profile a new target is printed, in which the user can select the most neutral tonal values according to his perception. After this, SilverFast computes a personal user profile and saves it. As a starting point, the scanner will automatically calibrate using the patented IT8-Calibration. Afterwards, the user prints a full Gamut Printing Profile Target with over 1,000 tonal values. Once this profile target has been scanned, SilverFast will automatically generate an ICC-Profile for the selected printer, ink and paper combination, and then store them in the system color register. This way it is guaranteed that your printer takes advantage of the the entire array of colors at all times. 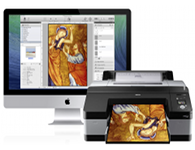 From scan to print, the "Zero Mistake" Workflow ensures complete control of the color settings. Regardless if professional photographer with a fine art printer or amateur, the user will easily reach optimized high quality results. 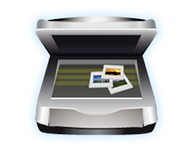 With the SilverFast Archive Suite 8 and the optional Printer Calibration, you as the user are provided with all the necessary tools to transform an analog picture into a perfect print-out. Until June 14th you will receive a 20% Special Discount. Just enter your personal Coupon Code « H54XT92K » during the order process in our Online Store. Starting with the latest release, you can now upgrade SilverFast 8 directly from the software. 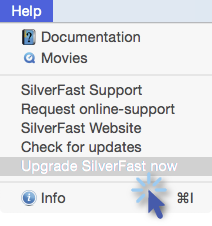 In the main menu under "Help" simply select the menu item "Upgrade SilverFast now". You will immediately get the upgrade options suiting you and your scanner without having to manually enter your serial number.